On Saturday morning, Senate Republicans passed a nearly 500-page tax bill that will impact not only the U.S. tax code, but also healthcare, domestic spending and even oil and gas drilling. The plan would cut taxes by nearly $1.5 trillion, and benefit major corporations and the richest Americans. On Saturday morning, Senate Republicans passed a nearly 500-page tax bill that will have dramatic impacts not only the U.S. tax code, but also healthcare, domestic spending and even oil and gas drilling. The plan would cut taxes by nearly $1.5 trillion. Major corporations and the richest Americans, including President Trump and his own family, would reap the most dramatic benefits. Overall, the bill is expected to add $1.4 trillion to federal budget deficits over the next decade. The bill passed the Senate 51 to 49, with every Democrat voting against the bill and all Republicans voting for it except for Senator Bob Corker of Tennessee. 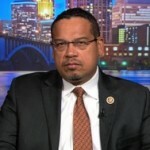 Minnesota Democratic Congressmember Keith Ellison is the first Muslim member of Congress. Ellison is also the deputy chair of the Democratic National Committee. On Capitol Hill, Democratic Congressmember John Conyers and Democratic Senator Al Franken are both facing calls to resign, after multiple women accused both men of sexual harassment and unwanted sexual contact. Army veteran Stephanie Kemplin says Franken cupped her breast at a USO event in 2003 as the pair posed for a photo, refusing to let go. Radio broadcaster Leeann Tweeden posted a photo showing Franken appearing to place his hands on her breasts over her Kevlar vest while she was sleeping on a plane in 2006 as they were both coming back from a USO tour. Meanwhile, Rep. Conyers is facing multiple accusations he sexually harassed or groped women—charges he denies. Among his accusers is Marion Brown, who said Conyers invited her to a Chicago hotel room in 2005, where he appeared in his underwear and demanded she touch him sexually. She says she was fired when she refused. In Honduras, tens of thousands of protesters poured into the streets Sunday to denounce alleged election fraud and to support opposition presidential candidate Salvador Nasralla. Last week, the electoral commission paused the counting of the votes when incumbent President Juan Orlando Hernández was trailing opposition candidate Salvador Nasralla, head of the Alliance Against the Dictatorship. On Friday, Hernández’s government suspended constitutional rights and imposed a military curfew. Tensions are rising in Honduras, where security forces have opened fire on protesters over the weekend, killing at least three people and injuring dozens more. On Sunday, tens of thousands of people poured into the streets to protest what many are calling an electoral coup d’état against opposition candidate Salvador Nasralla. Protesters accuse the electoral commission of rigging the vote in favor of incumbent President Juan Orlando Hernández, who is a close U.S. ally. Zenaida Velasquez is a Honduran human rights activist and one of the founders of the Committee of Relatives of the Disappeared in Honduras. Matt Ginsberg-Jaeckle is a member of La Voz de los de Abajo and one of the founding members of the Honduras Solidarity Network. He has been in Honduras for over a week leading a human rights observation delegation.